LaserBond is a specialist surface engineering company founded in 1992 that focuses on the development and application of materials, technologies and methodologies to increase operating performance nad wear life of capital-intensive machinery components. Within these industries, the wear of components can have a profound effect on the productivity and total cost of ownership of their capital equipment. As almost all components fail at the surface, due to material removal through abrasion, erosion, corrosion, cavitation, heat and impact, and any combinations of these wear mechnisms, a tailored surface metallurgy will extend its life and enhance its performance. 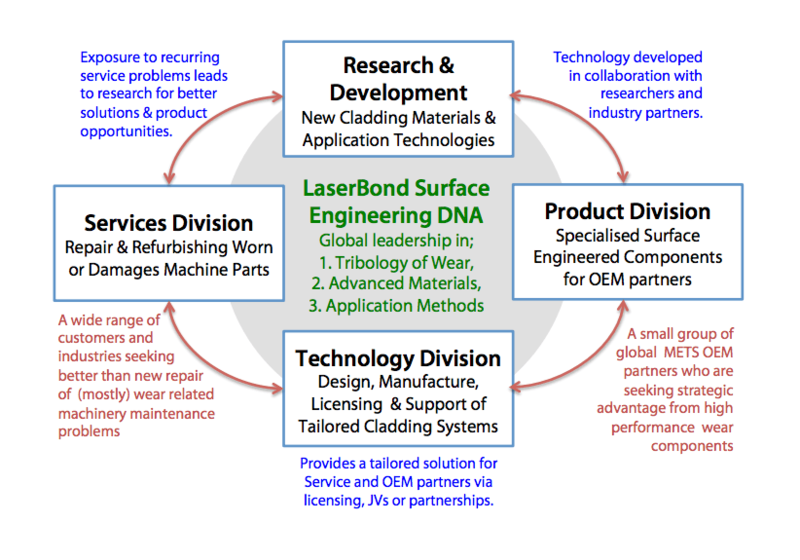 LaserBond recognises that its technology has applications across many industries as more sectors accept that surface engineering technologies can deliver significant cost effective imrpovements in productivity and/or lower total costs of ownership, mostly in resources and energy, agriculture, advanced manufacturing, defence and infrastructure construction. Tribology of wear and performance in heavy industrial components. Metallurgy and science of high performance materials. Optimisation of a wide range of materials and application methodologies. Identifying components, equipment or applications that benefit from our technologies. Customer partners with established needs and markets. Our customers are typically internationally recognised Original Equipment Manufacturers (OEMs) and capital-intensive heavy industries that endure high costs whenever their equipment is out of production for maintenance. These customers recognise LaserBond's focus on workplace health & safety, quality assurance and the environment which is delivered through our certified PAS99 integrated management system. WH&S benefits are often realised because the maintenance of equipment and replacement of worn parts is often carried out in potentially hazardous environments (e.g. on mine sites) and/or involves handling of difficult and heavy components. Many of our customers recognise that by reducing the frequency of required maintenance, the utilisation of LaserBond's services significantly lowers the risk of injury to personnel. Environmental benefits arise from LaserBond's ability to remanufacture and provide performance improvements to manchine parts that would have typically been crapped and repalced with new parts. The typical carbon footprint for a LaserBond remanufactured part is less than 1% of a new part, and with life improvments between 2 to 20 times of a standard parts, a carbon footprint of much less than 1% is achieved. LaserBond operates from facilities in New South Wales and South Australia.